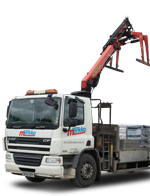 Naturally we stock a large range of timber and sheet materials and can dispatch bulk orders within 24 hours. Sourcing quality timber from sustainable sources is something we take pride in at Merkko. Chipboard, plywood and MDF are just a few of the sheet materials we can provide in quantities to suit your project. Call us if you need to discuss the requirements of your build and you can count on expert, impartial advice to help with your project.